No prize for guessing what the picture shows or where it was taken. This time, I decided to walk the extra mile, and used Gimp to correct the perspective. The lower right corner still won’t stay flat, though. 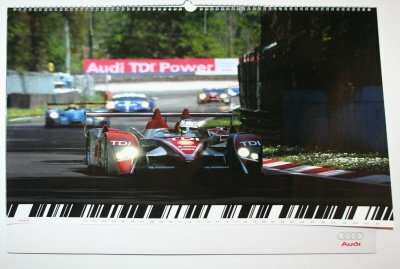 At the 2008 24 Heures du Mans, car #2 (an Audi R10 TDI run by Champion Racing under the Audi Sport North America brand) passes a screen that displays real-time video from a camera placed in its unoccupied right seat. I’m not positive, but from the helmet colors (silver with red stripes and yellow highlights), I think the driver is living legend Tom Kristensen. This car went on to win the race, while their #1 car ranked sixth and Audi Sport Team Joest‘s #3 car finished fourth. The lighting was difficult—despite the flash, you can see patches of light from the window shining onto the calendar, which is printed on very shiny cardboard. Sorry, Leisha, I just couldn’t resist. That’s the only wall calendar I have. The reason why the corner curves out from the wall is that there are three large computers just off to the right, with powerful fans blowing hot air towards the wall. 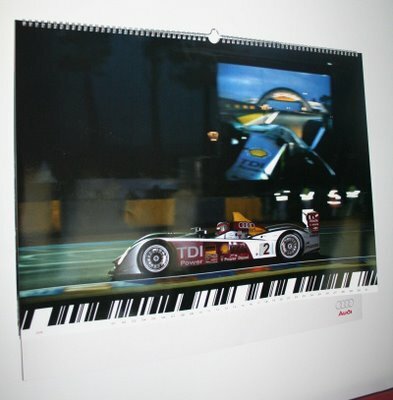 The photo is of an Audi R10 TDI Le Mans prototype—specifically, Audi Sport Team Joest‘s #3 car that finished fourth at the 2008 24 Heures du Mans (the #1 and #2 cars placed 6th and 1st respectively)—taken during a night-time pit stop. One driver is unbuckling to get out of the car as the other rushes to replace him; meanwhile, a mechanic is refueling the car.